All reservations are prepaid by debit or credit card, so you never have to pay the driver or worry about price change or over charge. Our system will send you a confirmation for every trip via email and a payment receipt for your financial records. 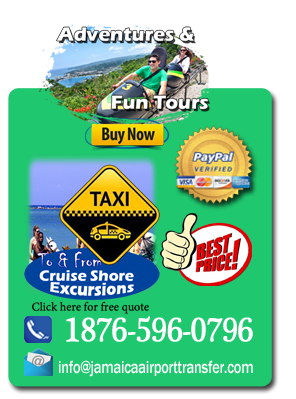 Optional book online and pay in cash on arrival Jamaica Airport Transfers Montego Bay and Adventure Tours and Cruise Excursions. It can be a bit nerve-wracking sometimes booking an airport transfer with other transfer company, but Jamaicaairporttransfer.com a reputable company will have all the information you need to set your mind at rest. For example, you should easily be able to find out what happens if you need to alter your booking because of a last minute emergency. Perhaps you are traveling with a child or someone in a wheelchair and need a specially fitted vehicle. Or maybe you always end up traveling with more luggage than you need and will have to have a vehicle with extra storage capacity. Whatever your query, Jamaican Airport Transfer will able to answer it.